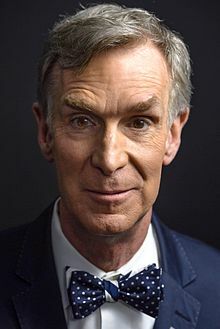 William Sanford Nye (born November 27, 1955), popularly kent as Bill Nye the Science Guy, is an Americain science communicator, televeesion presenter, and mechanical engineer. He is best kent as the host o the PBS children's science show Bill Nye the Science Guy (1993–1998). ↑ "Bill Nye, engineer/television genius". Public Broadcasting Service. Retrieved April 22, 2016. ↑ Rutgers. "2015 Commencement Speaker: William Sanford Nye". Rutgers.edu. Rutgers. Archived frae the oreeginal on May 6, 2015. Retrieved May 4, 2015. This page wis last eeditit on 13 September 2018, at 03:59.